This course is designed to assist all engineers and electrical officers in dealing with modern electronics equipment on merchant ships. 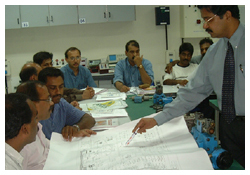 Course covers basics fundamentals of electronics, circuit analysis, shipboard circuits and practical fault finding. Identification of faulty electronic component in the PCB, and replacing with healthy component. Identification of basic electronic components. Study of Solid State devices. Thyristors and its practical application. Electronic circuits on Bridge equipment. Application of Electronic Logic Gates in Shipboard circuits. Practical sessions on various shipboard electronic circuits.